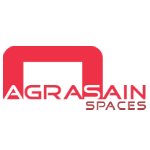 Agrasain Spaces is a Limited Liability Partnership Firm incorporated by partners Sh. Narender Aggarwal, Sh. Mukesh Kumar Aggarwal, Sh. Parmod Kumar and Sh. Himanshu Gupta to develop and setting up an affordable housing project at Opp. Industrial Model Town (IMT), Sector-70, Faridabad, Haryana spread over total land measuring 10.63 acres, out of which proposed project over land 5 acres & total constructible area 5,91,950 sq. ft., such land has already been acquired.